The EcoPure Reverse Osmosis Water Filtration System is the superior option to bottled water, delivering healthy drinking water right to your kitchen sink or refrigerator. 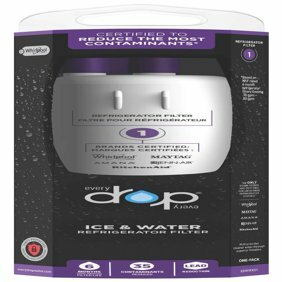 This 3-stage system saves you time and money on replacement filters, because when it comes to bottled-quality water, three stages are all you need. The encapsulated filter design feature means filter changes are quick and mess-free. No tools. No need to shut off water supply. No touching dirty filters. PURCHASE INCLUDES: reverse osmosis system, dedicated water faucet (sink must have an available faucet hole), one set of EcoPure pre & post filters (ECOROF), one EcoPure membrane (ECOROM), water storage tank, installation fittings, color-coded tubing, push-in connectors, and a written installation guide.